Nauru is a phosphate rock island with rich deposits near the surface, which allow easy strip mining operations. Nauru boasted the highest per-capita income enjoyed by any sovereign state in the world during the late 1960s and early 1970s. The Nauruan economy peaked in the early 1980s, as it was dependent almost entirely on the phosphate deposits that originate from the droppings of sea birds. There are few other resources, and most necessities are imported. Small-scale mining is still conducted by RONPhos, formerly known as the Nauru Phosphate Corporation. Phosphate mining is Nauru’s main export source and economic profit contributor. Primary reserves of phosphates were exhausted and mining ceased in 2006, but mining of a deeper layer of phosphate on the island began in 2007, secondary deposits are expected to last until 2030. Phosphate makes up 75% of Nauru’s exports, with the majority of phosphate exports flowing to parts of Asia, Australia and New Zealand. Manufacturing plays a very small role in the economy of Nauru, contributing about 3% of Nauru’s GDP. The small manufacturing industry comprises mainly coconut products and some handicrafts. Nauru's main export partners are South Korea, India, New Zealand, Australia, Japan, Poland, France and the United States. The economy of Nauru is primarily based on phosphate mining, offshore banking, and coconut products. Though for a time phosphates gave Nauruans one of the highest per capita incomes in the world, few other resources exist with most necessities being imported, including import of fresh water from Australia. Extensive phosphorous mining has left only 20% of the land suitable for agricultural use. Nauru has a very limited agricultural industry, and also suffers from frequent droughts. There is no formal commercial agriculture and limited subsistence farming. Food crops, primarily coconuts, are generally restricted to individual gardens and the area surrounding the small inland lake, Buada Lagoon. 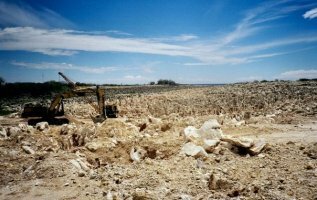 As a result of the degradation of agricultural land due to the phosphate mining process, Nauru's major import is food along with fuel, manufactures, building materials. Nauru is a net importer of goods and services, importing nearly all of its material needs, especially foodstuffs, petroleum products and fuel, machinery and equipment, chemicals. The country's net imports frequently exceed its total GDP. Nauru has no native supplies of oil and gas, relying entirely upon imported diesel for energy production and water desalination. No major oil companies operate out of or have a presence in Nauru. Nauru’s import-dependent economy is affected particularly harshly by increasing fuel and transportation prices. Nauru is reliant on imports of petroleum oil, oils and fats, natural rubber and wood for fuel. Nauru's main import partners are Australia, Fiji, New Zealand, China, Singapore, Japan, Solomon Islands. Nauru, officially the Republic of Nauru and formerly known as Pleasant Island, is an island country in Micronesia in the Central Pacific. Its nearest neighbour is Banaba Island in Kiribati. 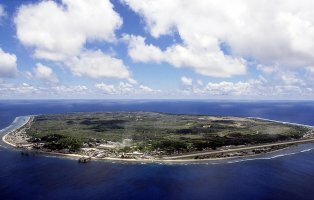 With 9,488 residents, Nauru is the smallest state in the South Pacific and third smallest state by area in the world, behind only the Vatican City and Monaco. The country is a member of the United Nations, the Commonwealth of Nations, the Asian Development Bank and the Pacific Islands Forum. Nauru also participates in the Commonwealth and Olympic Games. Recently Nauru became a member country of the International Renewable Energy Agency (IRENA). There is very little data is available on the economy for the tiny Pacific island of less than 4 square miles with a population of 13,000. While agriculture, forestry and fisheries combined provide 12% of Nauru’s GDP, the majority of that input comes from fishing: not as a local commercial industry but through sales of fishing licences. Nauru still does not have one single all encompassing national trade association like a national chamber of commerce or confederation of industries. However as Nauru’s economy has diversified, trade associations have slowly developed. The Nauru Fishers Association (NFA) is a body representing local fishers in the private sector on issues such as fisheries development and safety while the Nauru Island Private Sector Organisation and the Small Business Owners Association represents the collective interests of private companies in Nauru. Given the undeveloped private sector in Nauru, there are no regulatory institutions outside government departments such as the Ministry of Telecommunications and Ministry of Finance, and the national agency Nauru’s Marine and Fisheries Resources Authority. Nauru is not a member of the International Organisation for Standardisation so there is no national standards bureau. The Ministry of Finance is a good contact point for inquiries regarding standards, regulations and certification in Nauru.